Recent rapid developments in multi-modal optical imaging have created a significant clinical demand for its in vivo - in situ application. This offers the potential for real-time tissue characterization, functional assessment, and intra-operative guidance. One of the key requirements for in vivo consideration is to minimise the acquisition window to avoid tissue motion and deformation, whilst making the best use of the available photons to account for correlation or redundancy between different dimensions. The purpose of this paper is to propose a feature selection framework to identify the best combination of features for discriminating between different tissue classes such that redundant or irrelevant information can be avoided during data acquisition. The method is based on a Bayesian framework for feature selection by using the receiver operating characteristic curves to determine the most pertinent data to capture. 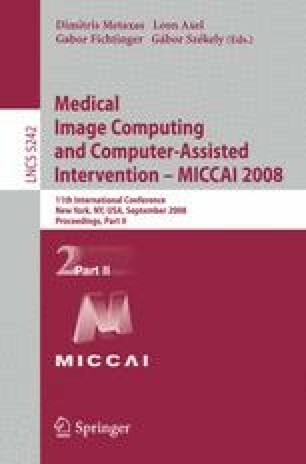 This represents a general technique that can be applied to different multi-modal imaging modalities and initial results derived from phantom and ex vivo tissue experiments demonstrate the potential clinical value of the technique.